The steadily growing town of Yelm. The Yelm prairie, as James Longmire recalled, was “covered with grass that was belly high to the horse.” When he arrived in the mid 1800’s the prairie was dominated with fescue grasses that were a native species to the area and would later be harvested for by farmers. The farmers used the grass to feed their livestock and to sell to other livestock producers for a profit. Access to the land was helped by federal government policies which made land relatively easy to obtain. The Donation Land Claim Act of 1850 and, later, the Homestead Act of 1863, placed land ownership within the reach of many with cheap prices and minimum residency requirements. Yelm is increasingly becoming a bedroom community for people who work outside the town. Few people know that Yelm once prided itself on being the “Berry Capital of Washington”. Yelm, originally was a farming community. In fact, before there was a town, there were scattered farms on the prairie and surrounding hills. Beginning with small subsistence operations, agriculture in Yelm developed into a more market oriented operation by the twentieth century. The work that followed, turning prairie into productive farm land, wasn’t intended for the weak of heart. Many became self-sufficient and grew enough to keep their family needs satisfied. The main reason for the isolation of many farmers was that the 160 acre or 320 acres sections that were claimed were so big that the closest neighbor would be quite a ways away. The reason for the limited expansion of agriculture at this time was simply there wasn’t a large enough work force to create an agricultural based community, however that would soon change. According to the 1870 U.S. Census every able bodied male in the Yelm area was either listed as a farmer or as a farm laborer. Subsequent census data shows that while the population on the prairie increased, the percentage of total workers gainfully employed in agriculture would decline. With the arrival of the railroad in 1873 and the actual formation of the town of Yelm work was found off the farm. More importantly, as the timber industry took off in the last decade of the 19th century, jobs were increasingly found in the mills and timber camps surrounding the prairie. In fact, as this trend continued, Yelm’s inhabitants were arriving in increasing numbers from former timber states like Minnesota and Wisconsin and less from farm belt states like Indiana or Iowa. Those that lost out became laborers on other farms. By 1920, only half of working men and women considered themselves to be farmers. Those farmers that could survive bought the land from those that couldn’t. Increasingly farmers focused their attention on berries and dairy products. The produce of choice in Yelm during the early 1900’s had become cane berries; blackcap raspberries, blackberries, and raspberries. These berries were native to the land and thrived in the area. 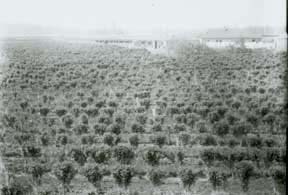 The production of the berries, during the peak year of 1929, exceeded 800 tons of berries on 485 acres. The gross return for that year was $128,000 at 8 cents a pound. Agricultural prices for many products, however, were declining during the twenties. The American economy, as a whole, began reflecting signs of the Great Depression at this time with higher unemployment and decreased prices. The depression wasn’t the only reason that berries in Yelm would soon lose their pre-eminence and make way for an expanded dairy and egg industry. The mosaic plant disease spread through Yelm crippling many berry farmers and killing 79% of the berry crops in Yelm and the surrounding areas. Farms that depended on berries for their major source of income were lost and forced to sell to dairy farmers. After this disaster many farmers turned to government aid programs of the depression. Close to $70,000 dollars was given to the farmers of Yelm to assist them with funds that had been lost by their diminished harvests. The dairy industry in Yelm at the time had consumed a large part of the land in the area after the mosaic disease hit the berry industry. The dairy farmers in the area, because of there need for many other materials, just didn’t milk cows they, also grew silage and corn for their own livestock. This was a major reason that the dairy industry owned so much land in the Yelm area. The dairy industry appeared to be much more successful than the berry industry in 1939. The profit was a 29% return for the dairy industry compared to the 15% that berry growers obtained. Though at this point in time, dairy farming seemed to be an unstoppable juggernaut, it too would soon take a fall and slowly fade from the scene in the Yelm area. The problem was jobs. With World War II looming and industries around the Puget Sound area gearing up production, finding workers was a more and more vexing problem for farmers. Besides this, farmers merely went elsewhere to work themselves. Farming in Yelm had been one of the major incomes for the area early on in its history. The small, changing scene of Yelm has seen many faces. From the days of subsistence farming to the heyday of the berry and dairy industry, agriculture was always one of the mainstays of the Yelm economy. These endeavors gave the little town character and that has been somewhat forgotten, but will always be a part of its history.